First, a lesson about watching films adapted from novels: never read a novel before seeing its corresponding film. That way leads to madness, as the burdened brain latches on and amplifies every little detail the movie gets wrong until it explodes in a shower of dissatisfaction. Allow some space and time between book and movie, however, and it becomes possible to appreciate the story as fitted into its medium. Thus, drawing on a lesson learned from Harry Potter and the Prisoner of Azkaban, which only truly came into its own for me once my memory shed everything but the novel’s highlights, I avoided revisiting Fitzgerald’s novel to appreciate Lurhman’s adaptation on its own terms. And now, with that little bit of wisdom imparted, on to the movie. Sumptuous filmmaking, decadent excess, a cheerfully anachronistic score – Baz Luhrman, singular among those few directors who rate as auteurs, knows how to throw a party. 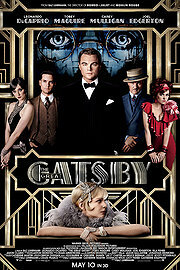 And with F. Scott Fitzgerald as master of ceremonies, the result is cinema that moves as well as it dazzles. Curiously, the rumblings that made it past my filters suggested disappointment, as if Lurhman’s adaptation of The Great Gatsby was yet another of those hollow spectacles Hollywood is fond of. I would argue that, as a visual medium, it is an achievement for a film to achieve a genuinely cinematic quality, the kind that demands a large screen in a darkened theatre. Too many films deliver this story, than quietly fade to black. Lurhman’s zesty work is certainly cinematic with its directorial acumen and brilliant production, of which the costume design is but its most obvious ambassador. The spectacle is perhaps too underappreciated in general, perhaps a bit too readily made subservient to substance. With respect to those quiet little dramas stripped of frills and flourishes in the name of authenticity – and many of my favourite films are as technically unassuming as they are narratively forceful – their lack of spectacle often calls into question the need for a large screen. In this is the reason why viewers enjoy the summer blockbuster season, despite complaints about nonsensical plots and craven attempts to part people from their money through inflated ticket prices; because sometimes we just want to be struck with awe, to be shown a story in a way that we cannot experience in reality. In delivering the jazz age in all its quasi-libertine glory, and depicting the stark contrast between the world of the wealthy and that of the poor, an exuberant director like Lurhman is, indeed, the right person for Fitzgerald’s material. Of course, if the spectacle comes imbued with substance we can declare ourselves successful discoverers of the Holy Grail. This is where the disappointment with The Great Gatsby is puzzling, because the film fills every beautiful frame with Fitzgerald’s characters and narrative. The nuances are there: the character flaw that leads Gatsby to his undoing, the unjust social context that amplifies his nostalgia to tragic proportions, the exposure of cold class warfare whose combatants invariably run hot. Tobey Maguire, as the story’s observer and narrator Nick Caraway, offers a grounded and subtly poignant perspective on a tragedy that is Shakespearean in scope but also uniquely American – which is, naturally, what makes the novel such as a seminal work. Leonardo DiCaprio, a natural charmer with considerable emotive power, embodies Gatsby with all the pathos the role demands. And the cast overall, which includes Carey Mulligan as Daisy Buchanan, add to the well-written script’s refutation of the notion that Lurhman did little more than assume the Wizard of Oz’s persona. While there are no doubt differences and liberties taken from the novel – such as a framing story in which Nick Calloway, undergoing psychiatric counseling, recounts his experience with Gatsby to a kindly doctor – the film distills the novel’s essence into a cinematic vessel that holds its own. The proof lies in this: whereas Gatsby falls victim to a monstrous tragedy, we nevertheless achieve a vindication of sorts. Like Nick Calloway, and unlike the story’s other characters, we can bear witness that Gatsby is better than the peers whose status he aspired to, that he is indeed great. That Lurhman is capable of evoking of sense of hope amidst a sense of tragedy, however bittersweet the blend, rates as a success.